The biggest fish in the sea feeds on microscopic plankton. A filter feeder, the Whale Shark's gills are specially modified to act like a sieve. As its teeth are redundant they are minute. It is one of only three sharks who filter feed, the other two being the Basking Shark and the aptly-named Megamouth. A slow swimmer, the Whale Shark often collides with boats as it swims on the surface where there is most food. It is on the IUCN's Red List as a Vulnerable species. This is one level below endangered. Its life history is poorly understood but it is known to migrate large distances. Populations appear to have been depleted by harpoon fisheries in South East Asia. The rise of dive tourism though, is making the fish more valuable alive than dead. Whale sharks are found in all tropical and warm seas except the Mediterranean. 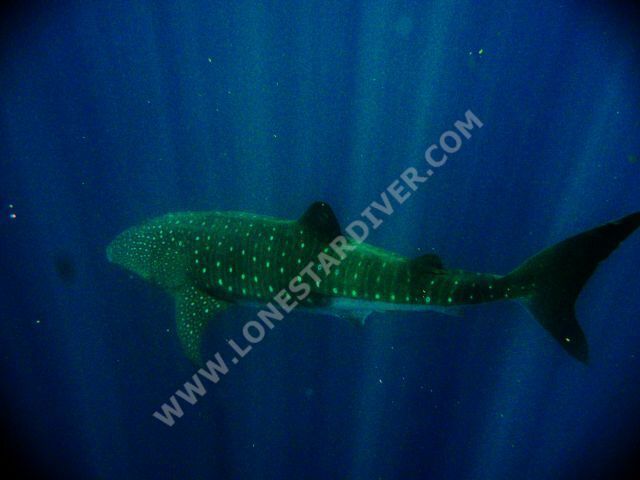 Ecotourism offering swimming or diving with Whale Sharks has developed in many countries including at Ningaloo Reef in Western Australia, Donsol in the Philippines, Placencia in Belize and Isla Contoy in Mexico. In all these areas, and in other countries like the Maldives, India, Thailand and Malaysia, the Whale Shark is protected. Submit images of your whale shark sightings.